National Marine Manufacturers Association president Thom Dammrich opened the Newport International Boat Show with a “State of the Industry” talk filled with statistics reflecting optimistic signs for the industry. Results from the Sept. 12-15 show seem to have backed him up. The Newport Exhibition Group, owner and producer of the Rhode Island show, says the 43rd edition of the event had an 8 percent increase in paid attendance from the previous year and the highest turnout since 2007. 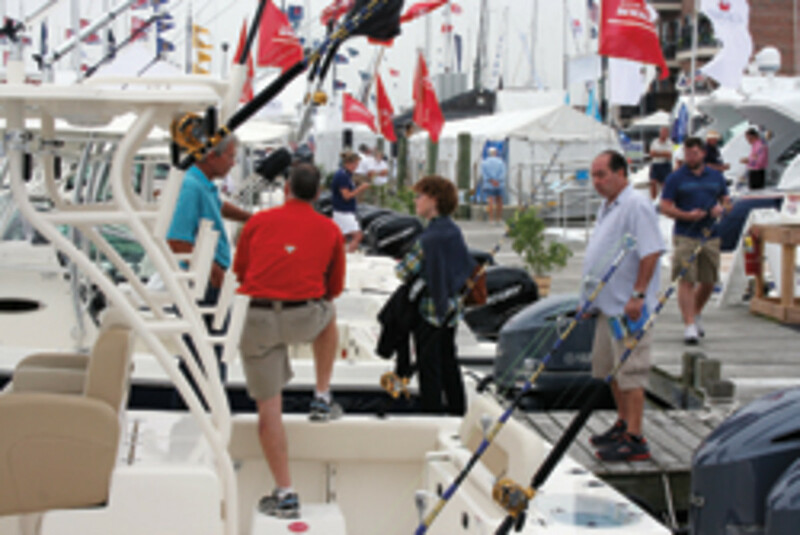 The show also was expanded this year with an adjoining basin opened at the Newport Yachting Center and filled with additional exhibitor boats. “Based on the feedback from exhibitors, the quality of the traffic and level of sales was fantastic. We hope this is indicative of a truly great year ahead and continued strong market growth for the boating industry,” Tom Delotto, director of the Newport Exhibition Group, said in a statement. The MarineMax Newport dealership had six boats on display — an Azimut 64, 54 and 48 and an Atlantis 38, 48 and 58. “Last year was slower, but we had a very good Newport show this year,” says dealership manager Frank Brennan. “I think you’re seeing improvements. One of the buyers was new to the dealership and the other had looked at the boat last year, Brennan says. Brewer Yacht Sales displayed two Princess motor-yachts — a V48 and a 52 Flybridge, making their North American debuts — and a Nord Star 24. Although no direct sales came from the show, Pugsley says his team discussed numbers on several boats and took an order for a new Nord Star 34. Ben Wilde and Wilde Yacht Sales displayed a 2013 Nordic Tug 34, a 2014 Nordic Tug 39 Flybridge and a 2008 Nordic Tug 42 Flybridge. Wilde says the 39 Flybridge was sold a few weeks later at the United States Powerboat Show in Annapolis, Md. Mark Mansfield, national sales manager at Cutwater Boats, says his company’s display was busy throughout the show. “We noticed there is a demand from boaters who exited boating five or six years ago — very positive,” he says. Cutwater regional dealer Winter Island Yacht Yard in Salem, Mass., sold two Cutwater 31s, and CEO Peter Haywood says his team left the show with several sales orders and a large number of strong prospects.